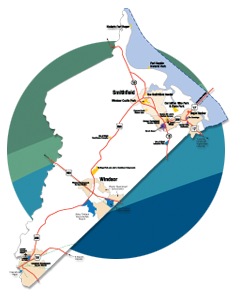 The animating purpose of the Economic Development Incentive Policy and Procedure shall be to enhance the ability of Isle of Wight County to foster and stimulate economic development in the County by inducing new businesses to locate in the County, and existing businesses to remain in the County or to expand their operations. The Isle of Wight County Board of Supervisors may grant qualified prospective businesses or developers a cash grant up to five years value of the machinery and tools taxes paid by the business. This program, administered by the Isle of Wight County Commissioner of Revenue’s office, allows owners of commercial and industrial properties that are at least 30 years old to apply for a five (5) year real estate tax exemption when certain improvements are made to the property. This matching grant program supports façade and streetscape improvement for commercial buildings along Main Street in Historic Downtown Smithfield. The establishment of an Arts & Cultural District helps position, promote and expand the arts community. It also serves as an economic development vehicle to foster growth in the downtown district, by offering financial incentives to arts businesses within the Historic District. Established in 2010, the Arts and Cultural District was incorporated within the already existing historic district in downtown Smithfield. The ordinance allows for several fees to be waived or reduced for arts-related businesses, such as zoning permit and business license fees, as well as fees for sandwich board signs. Property tax rebates and reduced water service facility fees are available to any new, expanded, or relocating business that builds new structures, expands or improves existing structures, or performs site improvements which increase property values by $25,000 or more. The Enterprise Zone Program provides state and local grants and local tax refunds for qualifying new and existing companies and property owners that create new full-time jobs and/or new taxable investment above specific thresholds. The new Isle of Wight zone includes Shirley T. Holland Intermodal Park Phase II and Phase III and a portion of the Isle of Wight/City of Franklin Revenue Sharing District, which includes the International Paper mill site and the former Franklin Equipment property. For more information about Virginia Enterprise Zone incentives, contact Chris Morello, Assistant Director of Economic Development, 757-356-1969. The POV Grant provides a grant to certain qualified companies, to incentivize the location of new maritime-related employment centers or expand existing centers in specified localities in order to encourage and facilitate the growth of the Port of Virginia. The Commonwealth’s Opportunity Fund (COF) is a discretionary financial incentive established to support projects that create new jobs and investment in accordance with certain criteria established by state legislation. Grants are made at the discretion of the Governor. Funding from the Virginia Department of Agriculture and Consumer Services supports local efforts in attracting new and expanding agriculture and forestry processing/value-added facilities using Virginia grown products.